History: Swiss born Haeusermann’s heart has always been in writing and producing. 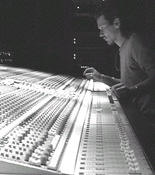 He has produced and engineered ‘radio ready’ tunes for rock, pop, hip hop and club bands and written dozens of songs since he moved to Los Angeles in 1993. After going to GIT (Guitar Institute of Technology) he wrote and produced scores for childrens’ CD-Rom titles like Pocahontas, Hunchback of Notre Dame and Aladdin. Staff engineering gigs followed at NRG and Music Grinder where he worked with slew of notable artists/producer/engineers including: Space Monkeys, Celine Dion, D Generation, Takuro, Matchbox20, En Vogue, Hanson, MC Hammer, Ally McBeal, Jewell, Matt Serletic, Phil Spector, Ron Fair, Dave Stewart, David Foster, David Reitzas, Tom Werman, Vonda Shepard, Rick Nowels, John Trais, Steve Lindsey, Sylvia Massy & Gustavo Borner. Rudy began freelancing in 1998 and has since engineered several sessions for Snoop Dogg, K-ci & Jo Jo and Kristine W. A big fan of 2" analog sound for recording drums and guitars Rudy is just as comfortable using ProTools and Nuendo when he's re-mixing and/or producing. Rudy has a private pre-production studio equipped with Steinberg Nuendo 96-Track digital recording system with all the bells and whistles, MOTU interfaces and Joe Meek Compressors/pre's. Recent clients Include: Jerry Sharell (Quincy Jones Publishing), Martika (Famous Music), Jd Webb and Sweet Heaven (Stiletto Ent. ), Seth Swirsky (EMI), Hammer, Storm, DAX (Death Row), Jaze (Universal MCA), Mario Hardaway (A&M), One Life to Live (La Face), Rob Zombie (Geffen), Tina Turner (EMI Europe). Rudy re-mixed the Swirl 360 "Hey Now Now," and "Don't change my world" for Mercury. Also, Rudy produced, wrote and re-mixed tracks with Deborah Gibson for Golden Egg on her ''98, 2000 and May 2001 releases. He also worked on the Sophia Maria "Prove yourself" on ITP records.Haeusermann engineered and mixed Danish #1 artist Erran DD's follow up album to his hugely successful "Still Believing." The album is produced by Eddie Chacon of Charles and Eddie fame and Paul Bruun. Rudy also had the chance to mix a track for Scandinavian legend Kim Larsen's upcoming album. He's developing and producing his favorite LA band, "The Trace," a nice blend of U2, The Cure and Radiohead (www.thetraceband.com). Electro-Rock band "Rurik" has released the album "The Order Of Chaos." The cd was produced by Rurik and Rudy Haeusermann with Haeusermann and Grammy Award-winner Warren Riker mixing. Rudy also had the chance to mix a club track for Lisa Marie Presley's "Lights Out" produced by Paul Gordon. Current credits: Hausermann has been busy lately...Recent projects range from Australian singer Wilson to mixing for composers Deddy Tzur, Ariel Blumenthal and Daniel Alcheh. Mixed the forthcoming EP of Australia's "Wilson", produced by Kristian Attard who is also playing bass and guitars, and with Fern Sanchez on drums.Mixed "Royalty's" new single "Number 1", featuring Frankie J.Working with Producers / Writers / Singers Ben Farr and J Farr, aka "FarrAway". Engineered and Mixed "Snake Charmer" for the film "Mega Python vs. Gatoroid", featuring Debbie Gibson and Tiffany. hear current production music here!